The trip Lawren Harris and A.Y. Jackson made to the Rocky Mountains in 1924 was a natural extension of their ongoing exploration of Canada’s many landscapes. Jackson had painted near Mount Robson for the Canadian Northern Railway in 1914, and in 1924 he was not any more enthused about the mountains than he had been then. But for Harris the trip was a first encounter with the mountains - a subject and experience he would paint and interpret over three decades. Harris painted a number of sketches on and around Maligne Lake on this trip. These sketches measured approximately 10 ½ x 14 inches. Later, in 1925, Harris started painting on panels approximately 12 x 15 inches. 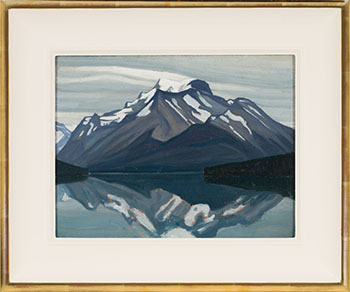 As in the sketch for the 1924 canvas Maligne Lake, Jasper Park (in the collection of the National Gallery of Canada, #3541), Harris has situated himself at one end of the lake looking across the water to the mountains. But Mount Unwin and Charlton - Maligne Lake, Jasper does not provide a characteristic foreground footing for the viewer. The centralized composition is dominated by the mountains that float in the middle of the panel, their forms reflected in the calm waters. The light is clear though overcast, the forms sharp. The flowing rhythms swoop up to the central peak and into the clouds above. From the mid-1930s, the bulk of Harris’s output consisted of abstractions, yet he also painted landscapes following his move to Vancouver in 1940. 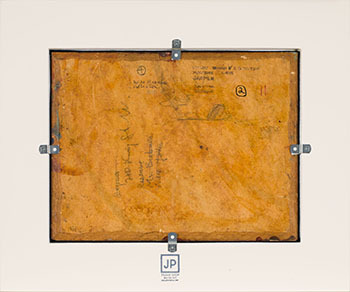 Most are painted on Masonite and were based on oil sketches painted between 1918 and 1931. 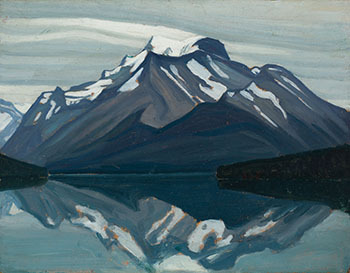 Mount Unwin and Charlton was worked up in a canvas entitled Mountain, Maligne Lake, in the collection of the Vancouver Art Gallery, that Harris exhibited with the British Columbia Society of Fine Arts in April 1951. The canvas is largely faithful to the sketch, though the clouds are more stylized, and the colour contrasts less sharp and more flat. As Lisa Christensen has noted, the still waters of the sketch have been stirred by a soft breeze in the canvas. 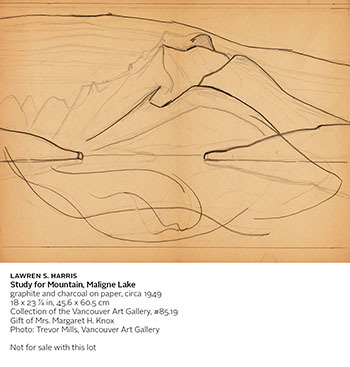 If Harris’s landscapes of the 1940s and 1950s seem at odds with his abstracts, a circa 1949 drawing entitled Study for Mountain, Maligne Lake, in the collection of the Vancouver Art Gallery (#85.19), after Mount Unwin and Charlton and not for Mountain, Maligne Lake, shows how, in fact, the two were intimately connected. In the drawing Harris delineated the silhouettes of Mount Unwin and Charlton, the sloping hills that enter the composition centre left and right, and the line of the clouds skirting the tops of the peaks, but curving lines in the water create a whole new rhythm that he would develop in Nature Rhythms (in the collection of the National Gallery of Canada, #17160), which Harris was working on at the same time. 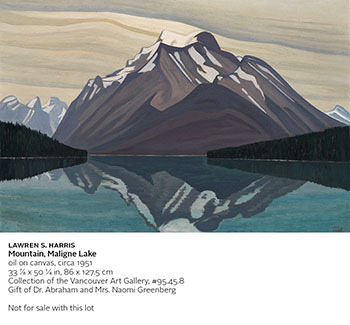 The artist described Nature Rhythms in his 1954 publication Abstract Painting: A Disquisition as an abstract painting “in which the forces of nature work together in a continuous movement of harmonious formation” - the perfect caption for Mount Unwin and Charlton - Maligne Lake, Jasper. We thank Charles C. Hill, former curator of Canadian art from 1980 to 2014 at the National Gallery of Canada and author of The Group of Seven: Art for a Nation, for contributing the above essay.